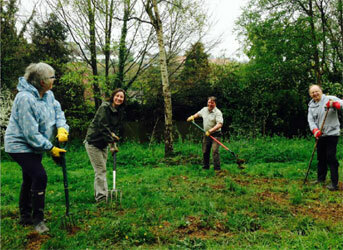 The Friends of Three Cornered Copse has been in existence since 2008, when along with other "Friends" groups, we were encouraged by the council of the day to form, with a view to supplementing the care of Brighton & Hove's green spaces by the City Parks department and its park rangers. You'll find a Friends Group for Hove Park, Green Ridge, TWEACK, Hollingbury and Burstead Woods and 50 on, who volunteer to work occasionally in these spaces to maintain the paths and promote the well-being of the green spaces. The groups work closely with the nine park rangers in Brighton & Hove, who provide tools, clear away rubbish in their vehicles, and offer guidance on treating vegetation, planting and other projects. In November last year, the council made a decision to save £175,000 from their budget, by devising a proposal for cutting the number of park rangers from nine to three. The rangers were texted by their management to inform them that their jobs were at risk. By reducing this team to three, the council will effectively end the work of the Friends groups around our city. Our parks and green spaces will suffer, litter will accumulate, paths overgrow and fences will remain unmended. A petition to save the park rangers has begun, started by their union, the GMB. The address is given below. For just a small amount of money a great deal of difference is made; let's hope the ranger service can be saved. More money than this is regularly found for outgoing chief executives. In the meantime the copse remains one of the muddiest places in town, as I write, in January, after one of the wettest winters in recent years. Only the dedicated dogwalkers, or the courageous mountain bikers, are to be found paddling through the deeply filled paths. When the water from the heavy rainfall tries to find its way downhill, streams have formed which track through the woods, clearing debris, and leaving a strange meandering path. Our work day for 16 January was cancelled because of the condition in the copse. But also because Garry Meyer, our assigned park ranger, was unwell. Our best wishes to Garry and his colleagues as they wait to hear the decision on their future. let's hope that we haven't had our last work day; there's always plenty to do each season.